I really enjoyed participating in the Open Contracting 2017 global summit. It was clear from the conversations that we need to involve vendors of e-procurement more and explore how public procurement systems can be improved using electronic government procurement (e-GP) integrating open contracting principles into its design and operation. This blog post examines how this combination can contribute to the delivery of improved development outcomes. E-GP is a transformational tool. When governments use information technology in purchasing public goods, works and services from suppliers, it leads to significant benefits including financial savings, robust audit trails, accelerated timescales, improved compliance with procurement legislation and a reduction in corruption. It also helps the private sector by improving access to bidding opportunities, reducing their bidding transaction costs, and eliminating some of the complexities of transacting with government purchasers. The supply market for e-GP systems is mature with some established providers offering a wide range of tried and tested commercial off-the-shelf solutions. These ready-made products are highly evolved and able to manage the complete end-to-end public procurement cycle. It is of course still necessary to configure the e-GP system to comply with the procurement legislation and local conditions of the country concerned, e.g., language and procurement thresholds. Once an integrated approach is the norm – when e-GP systems fully embed the Open Contracting Data Standard (OCDS) and use of open contracting tools is prevalent – the data that becomes available will help transform procurement and encourage innovative new tools and practices; governments and organisations will acquire and value true spend visibility, which is so lacking at the moment. Off-the-shelf e-GP systems give a very high rate of return on investment, often yielding a 5-10% reduction in prices, covering the investment and operating cost many times over. With public procurement representing approximately 14.5% of global GDP, it is evident that the potential benefits of savings in real terms for countries are huge and the investment in e-GP should be a high priority for all governments. 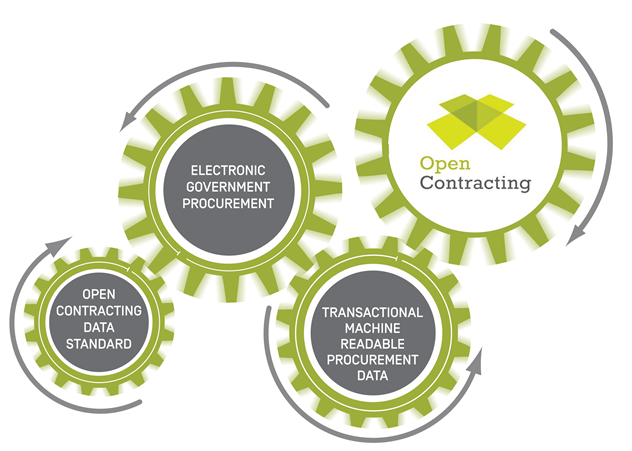 Using Open Contracting Data Standard (OCDS) data can significantly reduce the burden on IT infrastructure and make it easier to transact using e-GP in countries with limited internet connectivity. The exchange of procurement data in OCDS is much smaller regarding internet traffic in comparison to “dumb” PDFs, which lock out valuable machine-readable procurement data. There is a compelling argument for far fewer megabytes of dumb bid documents, but far more kilobytes of useable OCDS intelligent bid and contract data instead. E-GP offers a practical solution for collecting machine-readable, OCDS-compliant procurement data at a granular level from buyers and sellers transacting throughout the procurement cycle. E-GP is an essential tool for the operation of decentralized public procurement systems that are becoming the norm where it can collect data from hundreds of procuring entities throughout the country concerned. There are, of course, significant challenges that remain to be overcome aside from the IT infrastructure, business process reengineering and change management aspects that need to be addressed. Despite a growing recognition of the interdependence of e-GP and open contracting, e-GP vendors have yet to show real proactive interest in adopting OCDS as a standard feature. To address this current technology gap, it is important that the current demand-led approach continues and that governments, multilateral development banks, and bilaterals ensure that OCDS is a mandatory requirement for all new e-GP systems. Some countries already have non-OCDS compliant e-GP systems which are operating perfectly well, and they intend to retain them for the foreseeable future. In such cases, it may still be possible to extract and map non-compliant procurement data to a separate OCDS database, enabling the integration of internal data sets, use of open source tools, etc. This can reduce the burden on the e-GP system databases, drive analytics and even the public procurement portals, provide some degree of open contracting. For new e-GP implementations, these normally take many years from inception to full rollout, meaning that a significant volume of OCDS data may not be available for some time. Also, the phased implementation necessary for a successful transformational e-GP project means it will take some years to gather a critical mass of procurement data from all procuring entities for open contracting purposes. We must, therefore, expect a long transition period until all transactions are processed through the e-GP system and full open contracting coverage of the public procurement spend is achieved. Leadership and vision are particularly critical at this time, and the World Bank has provided practical help by producing a very comprehensive e-Procurement Toolkit which includes an Open Contracting Data Standard Implementation Methodology to help stakeholders wishing to implement e-GP. Encouragingly, the convergence of e-GP and open contracting is now underway with some tenders for new e-GP systems, e.g., Honduras, incorporating OCDS as a mandatory requirement. Valuable lessons can be learned from such pathfinder projects, particularly given the findings of the recent African Development Bank study “e-GP on the Move: Results and Analysis of a Survey in Africa”, which concluded that most African countries have yet to embark on the e-GP and open contracting journey and reap the benefits they offer. International organizations such as multilateral and bilateral donors could assist in filling the open contracting data gap by adopting the OCDS for their procurement systems. Improving the quantity and quality of open contracting data that they make available about procurement for projects implemented in their client countries would be a real help – for example, the World Bank-funded contracts worth US$14.4 billion in 132 countries in 2016 and there is a wealth of contracting data yet to be published. Donor funding can represent a significant share of a country’s total public procurement spend undertaken. Multilateral development banks and bilaterals could facilitate a quick open contracting country win for all donor-funded procurement, while the longer-term e-GP open contracting country systems are being designed, implemented and rolled out. Delivering the vision of an integrated approach to open contracting and e-GP will create positive dynamics through the capture of rich, high quality, and timely, machine-readable procurement data, leading to a modernized and open procurement ecosystem fit for the 21st century.